Nothing is more evident of construction throughout New York City than the visibility of fences, sidewalk bridges (sheds), and scaffolding. The DOB refers to them as construction equipment, and are among the highest permitted items in NYC. Aside from being sure signs of construction or inspections, they are there to ensure the safety of automobiles, pedestrians and property alike. Although a necessity for construction, standards are in place to protect the public from shoddy/faulty construction equipment, hence the requirement for DOB approval. Sheds, or sidewalk bridges, are used to protect the public in the case that falling debris, accidents, or any other indemnities associated with buildings. Sheds must be permitted by the DOB, regardless of the circumstances. Direct Access Expediting offers expedited shed permits. Our team of engineers, architects and expediters will ensure your drawings and filings are up to the latest codes. This allows the contractor to supply the shed quicker than if they did the filing themselves. Fences are typically permitted to enclose the construction site for public safety. This is most commonly done during demolitions, storefronts, and new buildings. These fences allow the site to be closed off from public access. Fences are permitted by the DOB, like other construction equipment. Depending on where the fence is located, it may require DOT approval as well. For some basic info on DOT permits, see our post here. Additional DOB or DOT permits may be required for other types of construction equipment. Construction equipment on buildings, such as chutes, require DOB permits. While construction equipment on the streets/sidewalks, such as jackhammers or cranes, require DOT permits. If you’re not sure which types of construction equipment require permits, and of which agency, please contact us now. What is Required for Construction Equipment Permits? DOB’s stringent and ever-changing codes make drawings difficult. Unless one has the knowledge of 20 years of experience, like we do. Many forms are required by the DOB in order to get the construction equipment approved. Direct Access Expediting handles the paperwork so you don’t have. Registered general contractors can pull permits to erect the shed and construction equipment. If you are not a registered contractor, we can help you register. It might be helpful to see our post on contractor registration as well. These documents will remain on file at their respective agencies for future reference. Having Issues with Construction Equipment Permits? Direct Access Expediting provides drafting, applicant services, and filing for equipment permits. With thousands of permits under their belt, you can ensure that your project will have its construction equipment permitted in no time. We have worked with construction equipment providers for over 20 years, providing quick permits with affordable pricing. 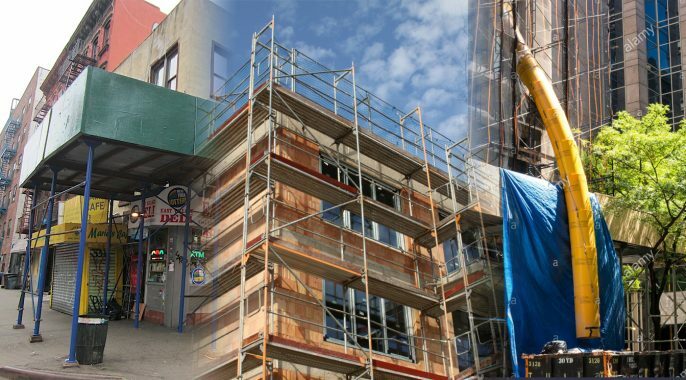 Direct Access Expediting handles everything from the drafting in accordance to DOB standards, filing and permits. Contact us today to hear how we can help or get an estimate. Posted in DOB, DOT and tagged chute, construction equipment, DOB, fence, permit, scaffold, shed. ← What is DOT Revocable Consent?